Arvixe was founded in 2003 at San Luis Obispo, CA. They have been providing hosting for personal, small business and enterprise websites on a global level. They are also known for fastest growing hosting companies in the world. Arvixe prides itself in providing web hosting with a rare combination of unmatched reliability, quality, and affordability. Arvixe they provide their web service at an affordable price. They also got the best price in the market. 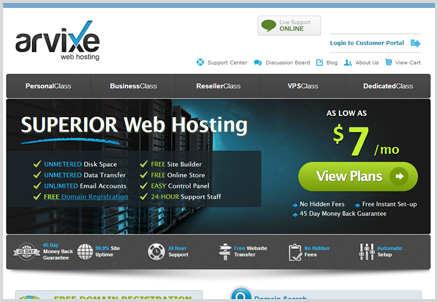 Their Linux hosting price starts from 7$ per month. And for windows it is just 8$ per month. For this amazing price consumers get unlimited bandwidth, unlimited MySQL databases, unlimited disk space, unlimited email addresses, cPanel control panel, a free domain for life, and more. In cPanel they provide very good features like MySQL 5 Databases, PostgreSQL Databases, HTML Editor, Dreamweaver Compatible, Adobe GoLive Compatible and lot of other features. Their US-based customer service and technical support representatives are working 24 hours a day, 7 days a week. So, you can be sure to get your issues resolved as quickly as possible at any time. I was with Arvixe for a short time, and they were able to provide great services, quick support and had my site up the whole time with no downtime. But of lately their service is not up to that mark and taking some time to resolve the issues. But their hosting price is really amazing and cheap.